Confession time: I have never been a big fan of Christmas. I love the idea of it but, truth be told, my tree is always lopsided, my gingerbread crumbly and the thought of shopping for presents sends me running for the Charles Dickens on my bookshelf. Enter Tania McCartney and Jess Racklyeft. 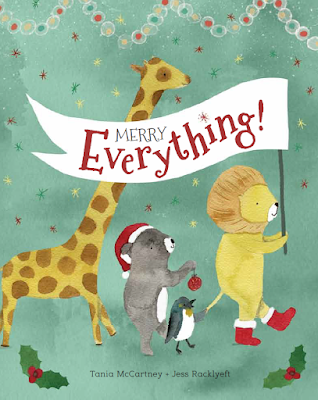 This jolly, sparkly gem of a Christmas book is enough to make the grinchiest Grinch among us revel in the festive fun. It's Christmas Eve and the world is 'buzzing with busy'. There are baubles to hang, songs to be sung and scrumptious treats to prepare. A sneak peek into the festive homes of animals around the world captures the magic and togetherness that is the true essence of the Christmas season. Each page shines with a love of this season and Tania's words drip from the tongue like brandy down the side of a plum pudding. Lush language – 'Lashings of shimmer to hang' – and a spirited rhythm – 'Seeking and creeping and sneaking ... No peeking!' – make it a delight to read out loud. Jess has created an adorable collection of creatures, from bees and bears to whales and wombats, each busy preparing for and celebrating the season. There are monkeys stringing stars among the trees, ducks pulling crackers in the pond and flamingos snapping selfies by the pool. The book is peppered with sweet memories and fresh ideas for creating special family traditions. Even the endpapers (handwritten envelopes and packages to animal families across the globe) highlight the thrill of Christmas and the importance of bringing together loved ones, near and far. Heartwarming, joyful and visually evocative, this is sure to become a family treasure, adding a little extra magic to children's hearts as they count down to the big day. A huge thank you to this creative force for instilling in me a Christmas spirit that's suddenly looking truly merry and bright. Penny your review made me smile from ear to ear. I can't wait to buy a copy of Tania and Jess's book. Not only do I love Tania's writing and Jess's illustrations but I am a huge Christmas fan. I can not think of anything more blissful than a Christmas book created by this dream duo and the gorgeous Windy Hollow Books. We love Christmas, too Penelope! The perfect time of year to surround ourselves with love and magic. Glad you enjoyed this and are feeling the spirit.